This island is a very special one: It lies in one of the most beautiful parts of the Bahamas and boasts white sandy beaches and the potential for an airstrip. It has all the basic essentials for development. It is situated very near well-known island resorts and existing airstrips. Big Darby Island is located about 95 miles from Nassau, 14 miles from Great Exuma and 250 miles from Miami. It lies almost in the centre of the chain of some 360 islands known as the Exuma Cays -the yachting, sailing and fishing paradise of the Bahamas. 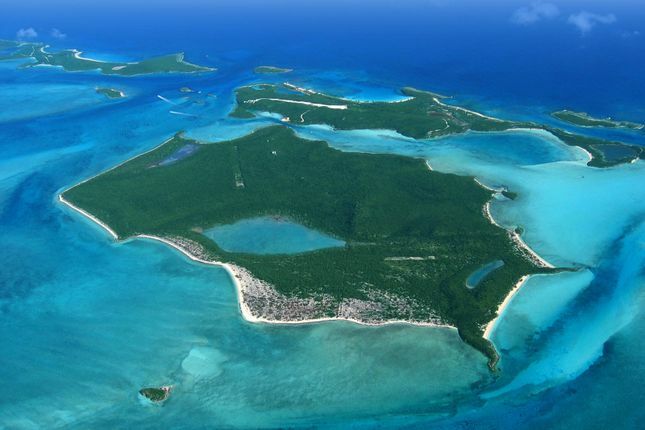 The nearest islands are Rudder Cut Cay (with airstrip) and Musha Cay, both owned by illusionist David Copperfield. This island is surrounded by crystal clear turquoise waters and features several white sandy beaches -in all approx. 21,650 ft. Of water frontage. The highest elevation is approx. 80 ft. Which is exceptionally high for the Bahamas. The island can support a 3,000 ft. To 5,000 ft. Runway and is adjacent to a deep protected natural harbour. An imposing 7,000-square-foot castle built by an Englishman, Sir Baxter, in 1938 is located on the island. The castle could be rebuilt into a spectacular home or clubhouse. A survey of a proposed development plan is available. A network of paths and walkways extends in southerly and westerly directions for a distance of 1.8 miles. This is a great opportunity to own a large island island in The Exuma Cays. Please contact us at for any inquiries. Property descriptions and related information displayed on this page, with the exclusion of Running Costs data, are marketing materials provided by HG Christie Ltd, and do not constitute property particulars. Please contact HG Christie Ltd for full details and further information. The Running Costs data displayed on this page are provided by PrimeLocation to give an indication of potential running costs based on various data sources. PrimeLocation does not warrant or accept any responsibility for the accuracy or completeness of the property descriptions, related information or Running Costs data provided here.